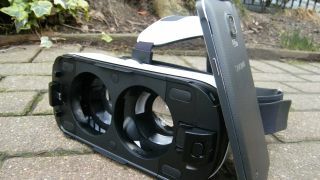 Samsung tested the virtual reality waters with the launch of Gear VR for the Galaxy Note 4, and clearly it's keen to keep pushing forward in this area: it's launching a new Gear VR Innovator Edition for both the Samsung Galaxy S6 and S6 Edge. The new headset will work much the same as the Note 4-fitting variant, but has been designed to be compatible with the 557 ppi display of Samsung's new smartphone duo. The device, a collaboration with Oculus VR, will make use of the phones' 5.1-inch Super AMOLED displays, smaller than the Note 4, meaning a denser, less pixelated screen. That also means a 15% reduction in the overall size of the headset. The field of view is still 96 degrees, but the 14nm Exynos Octacore means better performance, while Samsung now lets you power the device when in use via the USB.